The Johns Hopkins Center for Communication Programs (CCP) implemented the Health Communication Component (HCC) in 10 districts of Sindh, Pakistan under the USAID’s Maternal and Child Health (MCH) Program. The overarching project theme, Bright Star Movement (Working Together for a Brighter Future - Hum Roshan To Kal Roshan), aimed to harmonize maternal, child, newborn health and nutrition messages through mass media, local media, and interpersonal communication activities. The Bright Star movement also provided an aspirational and participatory approach to the health communication interventions in Sindh. The commitment Pakistan made at the London Summit in 2012 was to raise the contraceptive prevalence rate (CPR) to 55 percent by 2020. As part of this project, CCP conducted the Bright Star Family Planning (FP) Thematic Campaign. The Family Planning campaign leveraged the popularity of the Bright Star Movement to 1) increase knowledge and access to family planning services; 2) increase the contraceptive prevalence rate; and, 3) reduce unmet need for family planning. The campaign ran from March to May 2017. There is a typical process of decision-making when it comes to family planning. This process goes beyond the couple to include the husband’s mother who may be seen as a priority barrier that needs to be addressed when it comes to family planning. If a woman intends to use FP, she will only use when husband also agrees. The husband’s mother has a huge influence on whether a couple decides to pursue family planning or not. Following a consultative design workshop, PWD, HCC, and Costed Implementation Plan designed a campaign strategy to reach married women and men (with one child) through a number of wide-ranging community, mid- and mass media level activities. The strategy focused on the ideational factors around family planning and identified gateway behaviors. Couples will have increased in-depth knowledge of modern FP methods and the self-efficacy to discuss, agree upon, and plan to access FP services. Couples will feel empowered and supported to make their own decisions regarding their FP choice and will increasingly access FP services. Households and communities will challenge the notion that FP is solely the responsibility of women and will feel inspired to go against norms and/or traditional (and religious) practices to support couples in their decision to plan their families. Individuals will have increased confidence in the public health sector and will continue to demand safe and effective health services for planning their families. Individuals, households and communities will feel inspired to overcome barriers and challenges to become a “Bright Star”. The campaign materials were designed for local context and overall family planning situation in Pakistan. 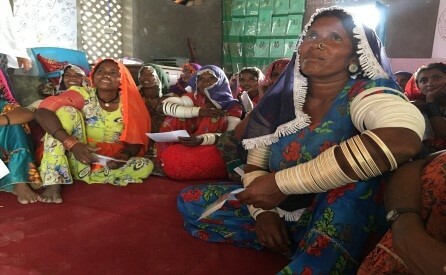 The HCC project imbued campaign materials and activities to be reflective of Sindh in particular, the ideation theory, the pathways framework, key target audiences based on specific reproductive health life stages and other related factors. The campaign was designed to recognize the central role of the mother-in-law in family decisions. The campaign media and materials included two short films, two television commercials (TVCs) and two radio spots, along with flyers and calendars distributed during the mass, mid and community level media activities. All materials used an entertainment-education (EE) approach and storytelling. The materials aimed to capture the attention of men and women on the importance of family planning methods, birth spacing and other positive health-seeking behaviors. Campaign goals and materials were developed and finalized through a series of consultative meetings and workshops with stakeholders. The campaign goals focused on building a supportive and enabling environment that reflected two key drivers of family planning behavior: 1) husband’s advocacy and supportive role of mother-in-law and 2) joint decision-making between husband and wife. By improving communication skills, the FP campaign worked to enable couples to increase their access and use of family planning services. During pre-testing in rural and semi-urban settings, focus group discussions revealed that the majority of respondents found the materials appropriate and relevant. For example, the short film’s storyline, which depicted a happy and prosperous life if there is spacing between childbirths, was found to be relatable among the focus groups when tested. The storyline was based on a split-screen in which bright and dark sides of the situation were presented. The bright side showed that if a woman spaces her births, there will be prosperity for the whole family. The dark side showed a gloomy state of affairs for a woman whose children were born too close together. The positive and negative transitional characters and their stories let target audiences go through an indirect learning experience where the consequences of their current or transitional behaviors were shown through an entertainment package. This helped them reflect upon their own behaviors and, hopefully, change them for the better. Positive characters exhibited positive values and were welcomed by the audience. The negative characters showed negative values and were discouraged by the audience. For instance, in the first short film titled, Madaar, the negative character of Bachal is a man who thinks childbearing is a woman’s main role and it does not matter if she is going through health issues upon repeated childbirths. The audiences were not liking his behavior. On the other hand, Bashir, who was concerned about the health of his wife and was open to using spacing methods, was liked by the audience. Campaign Implementation: The campaign was implemented at the interpersonal communication, mid-media and mass media levels. Community-level activities focused on Family Planning and were carried out by the Lady Health Workers (LHWs) and Community Health Workers (CHWs) in non-LHW covered areas. The mid-level media activities were carried out to engage primary audiences, i.e. married women and men (with one child) and mother-in-law (husband’s mother) through meetings at mohalla (neighborhood) and flotilla level. The mohalla (neighborhood) meetings were held to engage target women while the flotilla meetings were conducted to engage target men. In each district, the short films were shown during large community gatherings and LHW and CHW meetings. 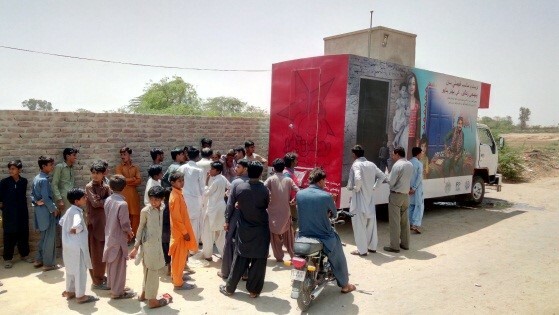 These film screenings were paired with short health discussions and later followed by a Grand Mela Event (often about two weeks later following the initial rollout). The Grand Mela Event, the largest of the community gatherings, combined both entertainment and health information including short film screenings (on family planning), health talks, health stalls, art, music and cultural shows. 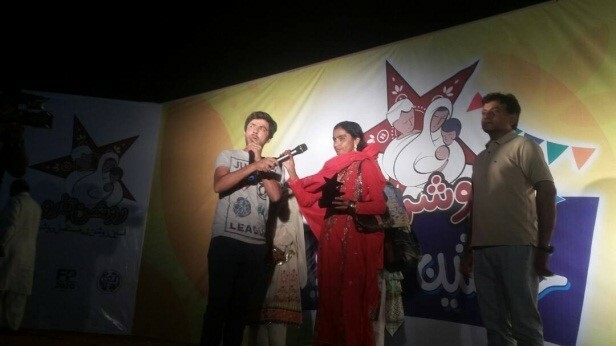 A key highlight of the grand mela-events was the Bright Star Awards Ceremony in each of ten intervention districts. HCC identified Bright Stars– individuals working to improve maternal and child health in their communities­– at the district level. During the ceremonies, project leaders recognized Bright Stars for their efforts in each of the ten intervention districts. A total of 148 Bright Stars were awarded during the ten Grand Mela Events held in ten HCC intervention districts. Campaign Monitoring: A total of 14,889 target women and men (8,188 women, 6,701 men) participated in mohalla and flotilla meetings held in 10 HCC intervention districts. In ten Mela events held in HCC intervention districts, approximately, 50,000 plus men and women participated. Mass-media campaign targeted more than four million through TV spots and almost five million through radio spots. The participants shared that short films were very engaging and motivating for them. Using the EE approach at each step of development and implementation of multimedia products actually helped to engage the target audiences significantly. The complex issue of family planning, which is often regarded as a taboo topic in Pakistan, generated discussion among the target men and women. In fact, community members were so motivated that some married women immediately adopted family planning methods. Also, Mothers-in-law were so motivated that they specifically wanted to support their daughters-in-law the use or adoption of family planning services. The use of EE products paved a way to talk about the complex and often taboo issue of family planning. HCC found that storytelling and thoughtful characters in EE programs can help programs to achieve the desired end result related to social and behavior change communication though it is always seen that behavior change takes time. The target men and women participated keenly in union council and village level flotilla and mohalla meetings respectively and took great interest in discussing their issues with health experts after watching both short films. Similarly, the target men and women intently watched short films during the grand mela-events held at the district level. We [women] will return to our homes with this learning; we will share it with our families, particularly with husband”, she said. 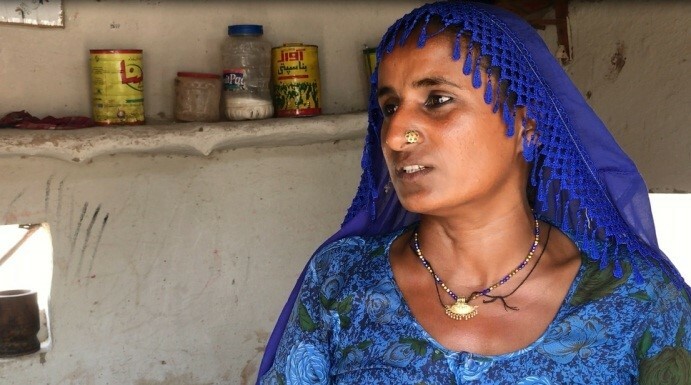 “It has become clear to me that ...my husband and I need to take a mutual decision for family planning adoption and should seek support from his mother too.